For high quality, banks-conform wind measurement campaigns, as requested by experienced banks and investors, the entire measurement system should be tailor-made to the wind project planned at a specific site. Thereby in any case it is crucial to comply with pertinent standards, and even to go beyond them. The equipment standardly recommended by ProfEC Ventus is in line with ISO / IEC 61400-12-1 and MEASNET (as the most frequently considered benchmark for bankable measurement equipment and measurement system characteristics), and also can be tested against any other banks requirements worldwide. Highest reliability and accuracy of the measurement systems are our superior objective, lowering the uncertainties involved! Our onshore wind measurement masts rage from 40m to 160m and include tubular as well as lattice tower structures from galvanized steel or aluminium. Our free-standing offshore wind measurement masts range up to 110m height with boom lengths of about 20m. We deliver and/or install individual equipment components as well as pre-confectioned measurement systems including all cables and junctions for out of the box installation and operation. Suitable sensors, equipment, industrial data logger with flexible configuration, calibrations and communication interfaces like UMTS, (W)CDMA(2000) or satellite modems enable our clients to access their measurement stations at any time and virtually anywhere in the world. As fall-back option Serial, USB and Compact Flash interfaces can be used. If any wireless network is present, data files to the Client and/or to our Virtual Measurement Access (V.Mac) Platform on a daily base. 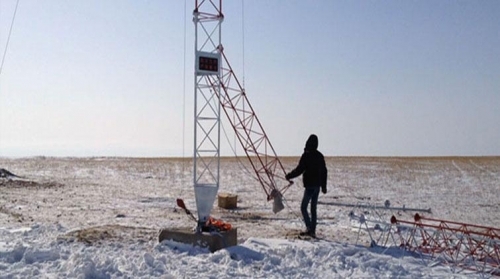 All items are proven and do operate under most extreme conditions from -50°C in the middle of a snow-desserts of Mongolia to + 60°C like in highly remote desert conditions, or rural, tropical oceanic island situations. Our systems provided still achieve a complete 100% data coverage even under such extreme conditions. We perform data logger calibraton, line-2-line calibration of the entire measurement system and we offer optional calibraiton for all measurement sensors. In case of huge wind farm areas or (semi-) complex terrain, often several wind measurement masts are recommended. To don‘t stress the budget! Alternating masts can be applied. A second recommendation we make are in-situ tests of the anemometers, which permits to assess, if recalibration of sensors is already needed or not yet necessary, maintaining a low uncertainty of the sensors by valid and permanent calibration. Therefore we recommend a control anemometer of different type and make compared to the primary anemometer, yielding in a more reliable and consistent result of the in-situ comparison. In combination with V.Mac, we allow our Clients to real-time monitor and observe their measurement stations and data via Internet browser. V.Mac allows sharing data and reports, downloading data, inviting stakeholders with limited access to see specific data only, to easily perform quick checks on data quality and completeness, trends, etc. V.Mac service is free of charge for one year and comes with every data logger we are going to provide. We also do offer this service for other data and data loggers our Client may already have. Our V.Mac service can be applied independently of the hardware used, as long as data are made available to be stored on the V.Mac server of our Client or of us. Also automated alert messages via email or SMS are possible, allowing to immediately take actions in case that defined threshold levels are crossed (e.g. battery voltage drop, wind speed etc.). Please try out our V.Mac here and feel free to explore its possibilities and strengths: http://www.profec-ventus. com/services/v-mac.html and get a free test account.